While going through the winter 2012/2013 collections of the great designers, scouting for new trends, one particular thing stood out: the color blue. The color blue is generally seen as trustworthy, dependable and committed, but of course this depends a little bit on the type of blue we're perceiving. More vibrant blues become dynamic and dramatic and deeper blues are associated with wisdom and spiritual realization. Of course in a more literal sense most people would probably think of the sky and the sea when they think of the color blue, things that are always all around us. It is said that several designers where indeed inspired by the sea when they incorporated blue tones (especially cobalt) in their collections. The memory of how the deep (Mediterranean) sea cooled us in the hot days of summer is a happy one and therefore very comforting when found in our wardrobe. In retro fashion there is a lot less dependability upon the latest fashion trends in terms of cuts and shapes. We still prefer the classic lines of the forties, fifties and sixties and will stick to them. We do like however, to combine the beauty of the past with the beauty of today; so we give you retro blue :). 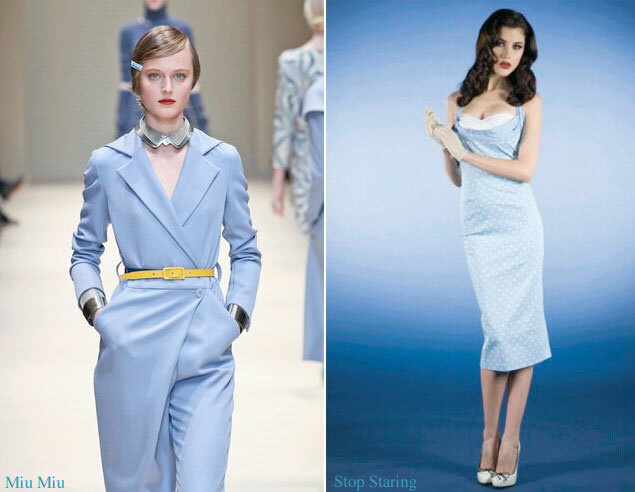 Miu Miu suit from winter 2012/2013 collection and Covergirl Dress by Stop Staring! These examples (there's much more) already show us that blue is versatile and can fit so many different moods. 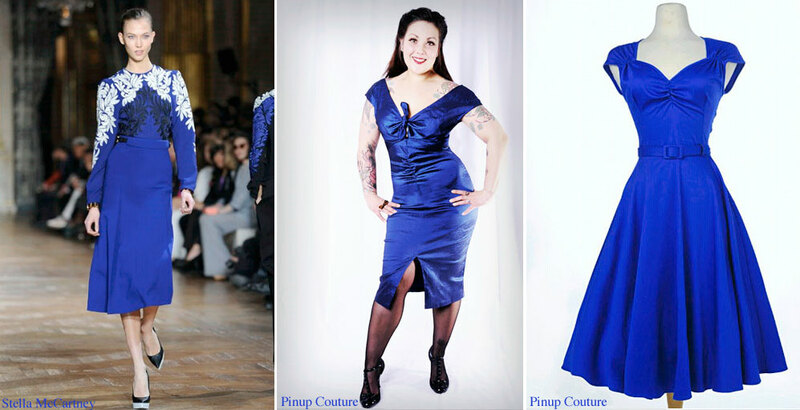 So a touch of any kind of blue in our (retro) outfit might actually keep us from feeling blue this winter!